With HKS long experience and know-how in engine development, we are challenging to make a new CNG engine by modifying the internal engine and fuel system, exhaust system, auxiliary equipment, etc. of a heavy-duty truck diesel engine. While HKS CNG engine has an equivalent power to a normal diesel engine, it still will travel long-distance operation of about 500km to 600km with 572L to 817L CNG. It greatly changed the concept of traditional CNG car near transportation. 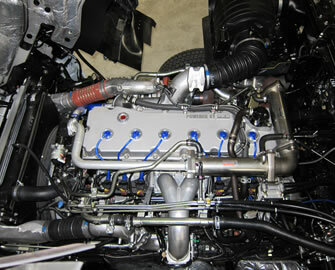 HKS CNG business will provide eco-friendly and fuel efficient system.